A tech family challenge, First World problems are not so bad, social media and narcissism, Father's Day and finding happiness -- that's what caught my attention this week. 1. How much time do you and your family spend online? A better question is: how much time do you and your family spend together offline? That is the question posed by Foresters Life Insurance who is challenging parents across Canada to shut off their screens for some 'Tech Timeout' with the family. Ten bloggers in the SavvyMom community will be taking the challenge this summer, my family is included. For one hour a day we need to participate in an offline activity together. This doesn't mean we all have to be offline for an hour each -- it means we have to spend that time together, without technology. This video is hilarious. If you can relate to it, you need to take the challenge, too. 2. Spending too much time on our phones/tablets/laptops is, without question, a growing concern in our society, but we'll admit that it's exclusively a First World problem. Here is a video you should watch with your kids (NOT during your Tech Timeout hour!) to remind everyone about keeping their frustrations in check. I'm reminded of the book written by Craig and Marc Kielburger, the Me to We brothers, entitled My Grandma Follows Me on Twitter: And Other First World Problems We're Lucky to Have. It's a great book, especially if you're looking for a graduation gift for the grade six to 12 set. I recommend it. 3. In not-so-surprising news, I recently read that social media is linked to narcissism. So that means you're not being cynical if you think all those people who constantly update their profile picture with a better shot than the last one are waiting to hear 'OMG, you're so beautiful.' There is now a study to prove it that I read on MediaPost, thanks to researchers at the University of Michigan's Department of Communication Studies. Apparently the Facebook brand of narcissism is more common among adults, with images of perfect lives. The same study reports that college students are more likely to broadcast themselves through Twitter because they tend to have an inflated sense of their own opinions. Which came first though -- narcissism or social media? Clearly the former. But given the rapid popularity of the latter, what does that say about our society? 4. One thing I learned about society from this awesome Father's Day article I read in Esquire this week is that fatherhood is in. Yes, being a dad is a big deal. Read this article in honour of your dad, your kids' dad, your dad's dad and all dads. It's worth a few minutes of your time. I promise. 5. Finally, a simple infographic for you. I love infographics because I am a visual person -- I like white boards and diagrams and flow charts. 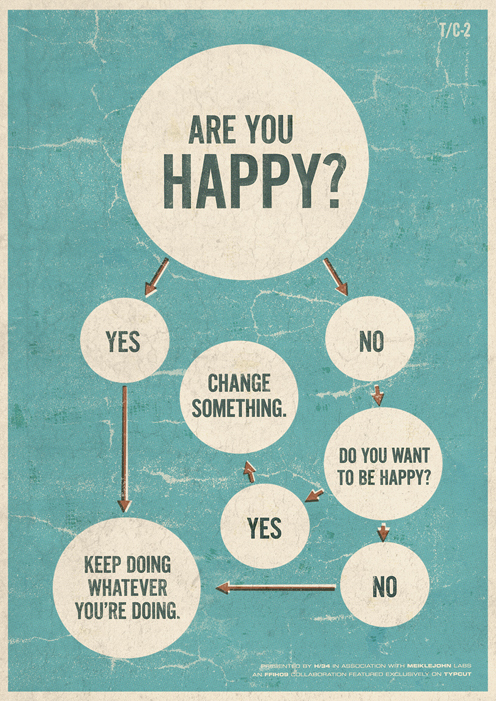 This is one I would like to put on my wall to remind myself that the route to happiness is a simple one. I hope it works for you.